In the 6000 years of recorded history, governments of the world were monarchs. Rulers were czars, kings, caesars, caliphs, emperors, and the like. 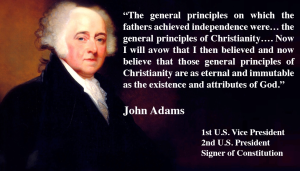 When America’s Founding Fathers fought the war for Independence from the tyrannical British crown, they did so with the understanding that every human being has inalienable rights which come from a loving and just God. By definition, these inalienable rights exists without America or any other nation, therefore no man nor government can take them from us. 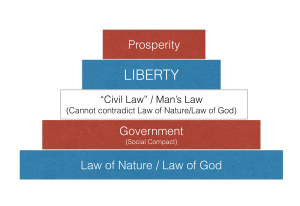 The right to life, liberty, property, self-defense, and the many other inalienable rights drove the Founders to create a nation which has “The Law of Nature” and “The Law of Nature’s God” as the foundation for our law and government. From this foundation, America was created with the intent that no law could be legislated to contradict this foundation. From this radical idea sprung forth a government of the people for the people and by the people where liberty allows creativity, imagination, and a productivity never seen before on the planet. 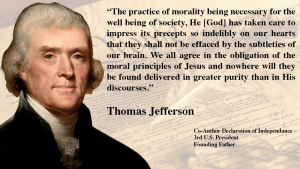 Because America built its law and government on a clear moral foundation of a reliance upon the God of the Old and New Testaments [“moral principles of Jesus” (Thomas Jefferson)], America is the longest standing Constitutional Republic, is the most prosperous nation, and has been and is the greatest force for liberty in the history of the world. It is the duty of every American to work daily to protect and defend this nation and the liberty which comes from the ideals enshrined in our Declaration of Independence that all Men are created equal and endowed by their Creator with certain inalienable rights. UTT wishes every American a happy and blessed Independence Day. Let each of us do our duty today to further the cause of liberty and fulfill our responsibility to maintain our great Republic. Great article. It’s shame that many Americans don’t appreciate our Founding Fathers and the contributions they made. However, millions who haven’t been brainwashed by the Left, do. We will jubilantly celebrate our independence and our inalienable rights while living in the freest country on the face of the earth. Thank you, JG. That was quite beautiful. I am in love with our country’s founding and the inspiring men whose ideas became a beacon of light for all the world to see. I read the words of these great, thoughtful men and I’m often moved to tears. Shakespear could not have constructed a more perfect phrase or thought. As Americans, we should be filled with pride and gratitude for being descendants of these wise and powerful men. I know I am. 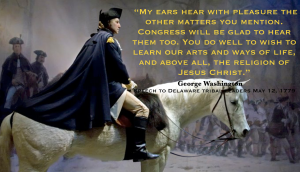 Thank you for your endeavor to keep the truth about the foundation of America. Due to the adoption by John Hancock of a motion proposed by loyalist Robert Morris of Pennsylvania requiring a unanimous vote for passage of the Declaration of Independence (which was born of a resolution by Richard Henry Lee of Virginia on 7 June 1776), had co-authors Thomas Jefferson of Virginia and John Adams of Massachusetts not acquiesced to the relentless demands of Edward Rutledge of South Carolina for the removal of any prohibition or even mention of slavery in the declaration, the South Carolina delegation would have voted “Nay”, and the quest to become free and independent American States absolved of any further allegiance to the British Crown would have been stopped in its tracks. What ensued though consequent of South Carolina’s refusal to support the abolition of slavery delineated in the Declaration of Independence, as had the other eleven States who voted (New York abstained) was a tragic disaster, I.e.,: Article-I of the Constitution, instead of the 13th Amendment 77-years later would have all ready addressed the involuntary-servitude/slavery issue when the document was signed on the 4th of July, 1776; the American Civil War would not have happened, no relevant predicate for shutting-down habeas corpus for the first time ever would thus have occurred, and had he even been elected, Abraham Lincoln would have died of old age.